It is an exciting time for the study of obligate pollination mutualisms. New mutualisms continue to be discovered, and information on individual systems is rapidly growing. Presently, there are at least seven plant lineages apart from Phyllanthaceae that contain plants pollinated by seed-parasitic insects (Fig. 13.1, Table 13.1). There is little doubt that more such lineages will be discovered, inasmuch as one or two new mutualisms continue to be uncovered each decade. The abundance and heterogeneity of documented cases of obligate pollination mutualism offer an unprecedented opportunity to examine key topics of broad ecological and evolutionary relevance. In this chapter, we review the basic natural history of the seven mutualisms known outside of Phyllanthaceae (Fig. 13.1, Table 13.1) and address the following questions that are critical to our understanding of obligate pollination mutualisms. Why do plants specialize to seed-parasitic pollinators despite the high cost imposed by the seed-feeding pollinator larvae? 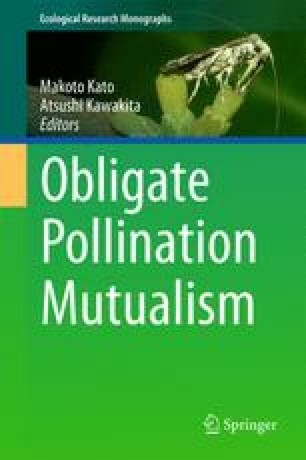 How are mutualisms maintained despite the potential for selfish partners to disrupt the interaction? Is pollinator specificity reinforced, and if so, why? Do obligate pollination mutualisms drive the reciprocal diversification of plants and pollinators?